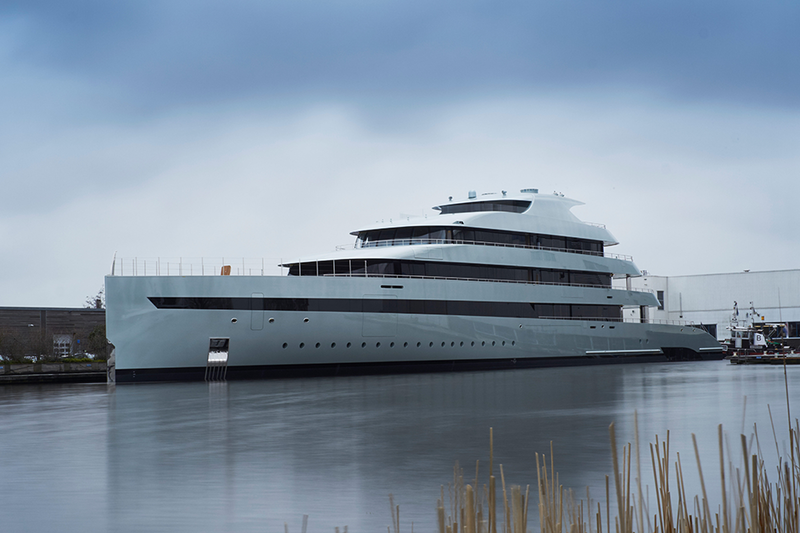 Latest addition to Master Yachts’ management fleet, the 83.5 metre Feadship MY Savannah was launched on the 25th of January by Royal de Vries in Aalsmeer (Holland). Savannah is the first superyacht to feature an eco-friendly blend of single diesel engine, three gensets, batteries, propeller, azimuting thruster and a streamlined hull shape. Offering fuel economies of thirty per cent, the pioneering electro-mechanical propulsion platform marries Feadship’s past experience and forward thinking approach within a pure custom creation. Further innovation comes in the form of a floating superstructure, an underwater lounge, the ‘open’ aft deck areas, and much more besides. The exterior colour scheme is Sea Foam metallic green – Savannah is the first superyacht to be entirely metallic painted (including the ceilings and fixed deck furniture) with the exception of the mast domes.